The UK election voting began at 0600 GMT amid tight security nationwide after two ISIS attacks killed 30 people in Manchester and London in less than two weeks, thrusting the issue of how to counter violent extremism to the top of the agenda in the closing stages of the campaign. British Prime Minister Theresa May speaks during a general election campaign event. 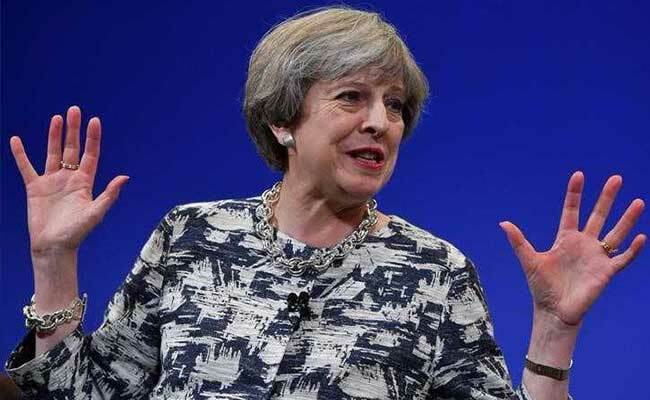 London: British Prime Minister Theresa May faces the voters on Thursday in an election she called to strengthen her hand in looming Brexit talks, with her personal authority at stake after a campaign that saw her lead in opinion polls contract. Voting began at 0600 GMT amid tight security nationwide after two ISIS attacks killed 30 people in Manchester and London in less than two weeks, thrusting the issue of how to counter violent extremism to the top of the agenda in the closing stages of the campaign. A final flurry of opinion polls gave May's Conservatives a lead ranging between five and 12 percentage points over the main opposition Labour Party, suggesting she would increase her majority - but not win the landslide foreseen when she called the election seven weeks ago. The polls supported the British pound, which held firm at $1.2957, near its highest levels in two weeks. The pound gained as much as 4 percent after May called a snap election seven weeks ago, as polls had initially suggested a landslide win for her Conservative party. Yet traders are cautious given the Brexit shock last year and the fact that her once-commanding lead over the Labour Party and its veteran hard-left leader Jeremy Corbyn has been narrowing through the campaign period. Voting ends at 2100 GMT. There will be an exit poll as soon as voting finishes. The first handful of seat results are expected to be announced by 2300 GMT, with the vast majority of the 650 constituencies due to announce results between 0200 GMT and 0500 GMT on Friday morning. Both main parties were on the defensive after Saturday's van and knife attack in the heart of London. May faced questions over cuts in the number of police officers during her six years as interior minister and Labour leader Jeremy Corbyn drew criticism for, among other things, voting against some counter-terrorism legislation. In the final hours of campaigning, both leaders returned to their core campaign messages. "If we get Brexit right, we can build a Britain that is more prosperous and more secure, a Britain in which prosperity and opportunity is shared by all," May said in a last appeal to voters to trust her to "knuckle down and get the job done". After becoming prime minister without an election taking place in the turmoil that followed last year's EU referendum, May wants a personal mandate and a parliamentary majority bigger than the one she inherited from predecessor David Cameron. Basing her campaign on the slogan of "strong and stable leadership", she has said she alone could face the 27 other EU leaders and clinch a deal that would give Britain control over immigration policy while ensuring favourable trading terms. She has portrayed Corbyn as the weak and hapless leader of a spendthrift party that would hit voters with a "tax bombshell", crash the economy and flounder in the Brexit negotiations. Corbyn has hit back that Conservative fiscal austerity imposed since 2010 has hurt the poor and widened social inequalities. May's campaign has not gone to plan, and as the poll leads of 20 points or more she was enjoying when she called the early election in April have shrunk, talk of a landslide victory has faded and her personal standing has taken a hit. As a result, the extent of her control over her fractious party and of her margin for manoeuvre going into the Brexit talks will hinge on the size of her majority, and on whether it is perceived to be a significant improvement on Cameron's. Provided she wins, she will have averted at least one risk: by pushing back the date of the following election to 2022 rather than 2020 as originally planned, she has ensured she will not face crunch time in the Brexit talks at the same time as an election. Some in the EU are hoping May does increase her majority, on the basis that the main risk for the bloc is a collapse in talks, and that is more easily avoided with a British government that is not vulnerable at home. "We need a government strong enough to negotiate," a senior EU lawmaker told Reuters this week. But others have sought to downplay the impact of the election regardless of the outcome, suggesting that it was little more than a domestic political sideshow. "Will the election of more Tory (Conservative) MPs give May a greater chance of securing a better Brexit deal? For those sitting around the table in Brussels, this is an irrelevance," wrote Guy Verhofstadt, the European Parliament's chief Brexit negotiator, in an opinion column in the Guardian newspaper. May's troubles began on May 18, when she announced a new policy on care for the elderly that quickly proved unpopular. She backtracked days later, prompting opposition critics to pour scorn on her central claim to offer strong leadership. Opponents were quick to remind voters that May had campaigned for Britain to stay in the EU before embracing Brexit after the referendum, and that she had insisted for months an election would not be in the national interest before calling one. May has reacted by sticking to her campaign messages, endlessly repeating the same slogans and appearing mostly at tightly controlled events - prompting many in the media to deride her as an uninspiring "Maybot". Meanwhile, veteran left-winger Corbyn, who was written off as a no-hoper by most political analysts, surprised on the upside with a policy-rich campaign that drew large, fervent crowds to his events - although sceptics say his appeal in the broader electorate is limited. He proposes building a fairer society through policies such as raising taxes for the richest 5 percent, scrapping university tuition fees and investing 250 billion pounds ($315 billion) in infrastructure - plans which the Conservatives say are fiscally irresponsible. "Labour's campaign has already changed the face of British politics," Corbyn said in a final campaign rally. "As we prepare for government, we have already changed the debate and given people hope. Hope that it doesn't have to be like this, that inequality can be tackled, that austerity can be ended, that you can stand up to the elites and the cynics." There was only one point of agreement between May and Corbyn, which was that the strongest signal that Britons could send to show they were not cowed by the recent spate of attacks would be to go out and vote.